The atmosphere of each of the movements is beautifully rendered. Quartet no.1, by the far the finest of the three, is made all the more symphonic through the contrast between the serene third movement and the energised fourth. And again in this finale, indeed all three finales, the energy of the music seems all the more vital for being passed around the players to the left and right of the listener. The audio quality is so good that you can hear which of the players is leading the ensemble at any given point, and Schumann's regular inversion of the textures to give the viola or cello the melody means that the music is not always led from the top. 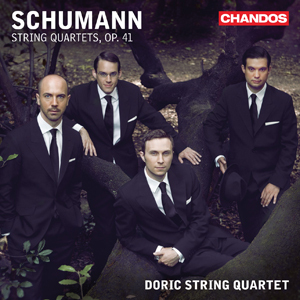 To me, this is close to ideal Schumann interpretation, and it augers well for the future recording career of the Doric Quartet, especially as Chandos now seem confident to let them loose on the core repertoire. I just wonder if they are going to get labelled as 'intellectual' players, in the way that Brendel was. Again, whatever is said about Brendel's 'thoughtful' interpretations, I really struggle to see that as a problem. In fact I think it is the very quality that distinguished him from most other pianists of his generation. But many others disagree, and they are probably the listeners who are going to have problems with this considered and elegant Schumann disc. The answer, I suspect, is to head straight for the repertoire in which profoundly thoughtful interpretation is an undisputed virtue – the late Beethoven quartets. The Dorics will have to get round to them one day, and as far as I'm concerned the sooner the better.